Your hurley should be a direct extension of your body. It should fit properly to maximise your coordination and skills in tune with your physical dimensions and the connection to the ground. Hurley Measurement Guide – Adults. 2. A second person places their finger horizontally under the grip and stands the hurley by your side. 3. Keep changing the size of the hurley until the finger meets your wrist bone. 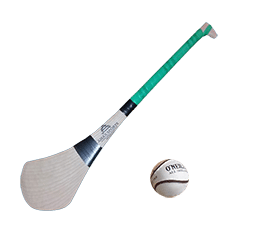 Using the correct size hurley is critical in ensuring you strike and control the sliotar to develop your skills. A general rule of thumb is players at adult level may go for a slightly shorter hurley depending on their playing position but rarely a longer hurley due to the improved likely hood of being hooked. 1. Hand position: If a child is using a hurley that is too large/heavy for them he or she will use their weaker hand at the top of the grip so that they have their stronger hand below to help gain enough power to swing/lift the hurley. This will develop a bad habit in striking technique (called Shoulder Striking) that will be very difficult to correct in years to come. 2. Confidence: A smaller hurley will lead to greater control with more successful strikes of the ball which in turn will build confidence early in a young player.